The SIMPLIS Periodic Operating Point (POP) analysis requires the user to designate a switching node which is the least common multiple of the periodic frequencies present in the circuit. For a circuit with a single operating frequency, such as a Synchronous Buck converter, the oscillator or the power stage switching node defines the periodic frequency. For a bridge converter where two switches are operating at one-half the oscillator frequency, either of the bridge switches is a suitable periodic switching frequency. The POP Trigger Schematic Device allows a convenient way to define the trigger gate for a POP analysis without having to define the gate using low-level syntax. Multiple Selections: Only one POP Trigger device is permitted on a schematic. Symbols placed on schematics in previous versions of SIMetrix/SIMPLIS can be automatically migrated to use the new symbols. The schematic tools menu Tools > Migrate Schematic Symbols to Version 8.00 will invoke a routine which migrates the existing symbols to the new symbols. As this action makes substantial changes to the schematic, it is recommended that you save a backup copy of the schematic first. Make the appropriate changes to the fields described in the table below the image. Propagation delay s The propagation delay of the POP Trigger Schematic Device. Divide by two? 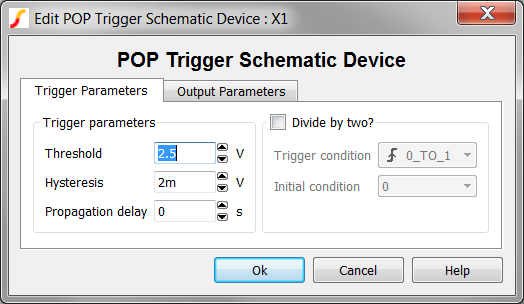 Inserts a toggle flip-flop into the POP Trigger Schematic Device model. Primarily used for bridge converters, this allows you to use the master clock as the POP trigger source, the toggle flip-flop will produce a divided by two signal for the actual POP trigger gate used by SIMPLIS. Initial condition The initial condition of the output when Divide by two? is checked. To edit the output Parameters, click on the Other Parameters tab. 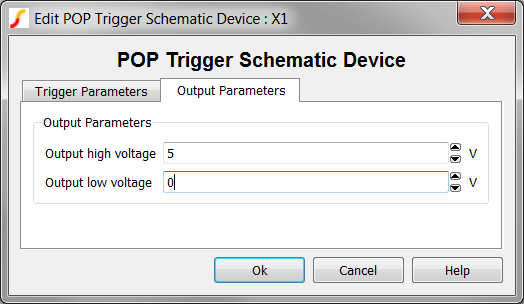 The parameters simply set the output levels for the POP Trigger Schematic Device. Changing these parameters will not help you circuit converge in a POP analysis, nor will changing these parameters affect the POP errors. Output high voltage V The high voltage of the output pin. Output low voltage V The low voltage of the output pin.